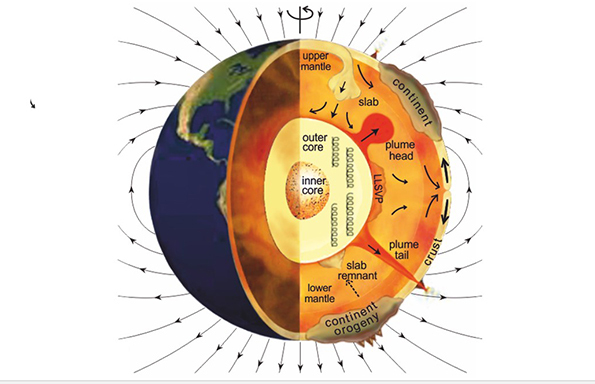 Using previously unavailable data, scientists at the University confirm a correlation between the movement of plate tectonics on the Earth’s surface, the flow of mantle above the Earth’s core and the rate of reversal of the Earth’s magnetic field which has long been hypothesised. This study is the first to demonstrate this correlation using records and proxies of global rates of subduction from various sources including a continuous global plate reconstruction modeldeveloped at the University of Sydney. These records were compared with a new compilation of magnetic field reversals whose occurrence is locked into volcanic and sedimentary rocks. It is based in the University’s world class Geomagnetism Laboratory and supported through the Leverhulme Trust and the Natural Environment Research Council. Citation: Subduction flux modulates the geomagnetic polarity reversal rate.